This class picks up where the beginner dog training class left off. Practicing previously learned exercises with more distance & distractions helps to solidify great habits. 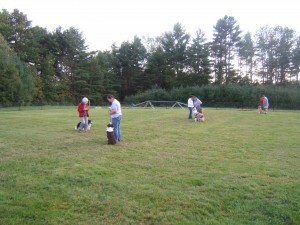 We will practice the requirements for passing the AKC Canine Good Citizen test, learn a few Tellington Touch techniques, teach our dogs cute and fun tricks, begin off-leash work, and if time permits, introduce you to the sports of Rally O & Wag It! Games. The goals of this class are to perfect our basic obedience skills and enhance our relationship with our dogs. We focus on Impulse Control, Attention Heeling, Rock solid stays, Distance work, Recalls, and any special requests of class participants, Your dog will be ready for any continuing education, such as Agility, Rally-O, Wag It Games, Competitive Obedience, Search and Rescue, Therapy Dog work, or whatever way you choose to enjoy your dog! Occasionally, we offer an abbreviated 3 week class with the focus on impulse control, polite leash-walking, Meets & Greets, as well as the Canine Good Citizen test requirements. The core goal of this class is to help you fully understand how to use reinforcement training most effectively – including how to best wean your dog off dependence on treats. I really think the intermediate obedience class we took and Rally O have made a big difference on Greta's focus on me and our development as a team.